To me…this is living! –Sitting ‘upstairs’ in an old VW Campervan; out there…somewhere on the open road. 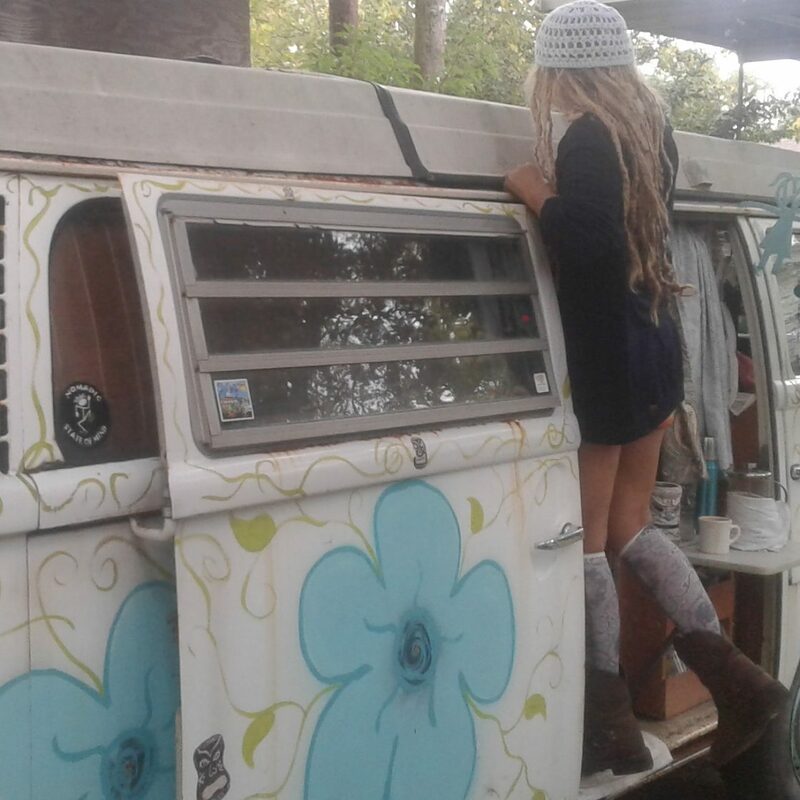 I would’ve given anything back when I was a kid, to have been able to travel with my parents in a van like our Peniki; the 71 Volkswagen Camp-mobile we’ve taken across the country and back…enjoying life as it was really meant to be lived. This picture I took of our little girl not too long ago evokes childhood the way most of us would have loved it to be. My daughter knows-not the riches of her own childhood…yet. Though I know, someday, she will look back on our travels in Peniki with the fondest of memories. Such a beautiful thought; to know I was able to bring such simple pleasures her way. I think back to my own childhood, and the simple joys we experienced each and every day; the hardships we often suffered through as well. We all know, once we reach adulthood, that there is no such thing as a perfect life. But…we can make it as close to perfection as possible by simply doing one little thing. That simple secret is so easy to see…most of us often miss it for many…many years. Follow your heart. That’s it! –That’s all it takes. Whether or not it makes sense to anyone but you–follow what calls you. Go where ever the wind whispers you to follow. I look back with regret only at the chances I have not taken, and the simple joys I have not stopped to absorb. It’s sort of like passing by the most fragrant of roses, without stopping to smell nature’s sweetness. 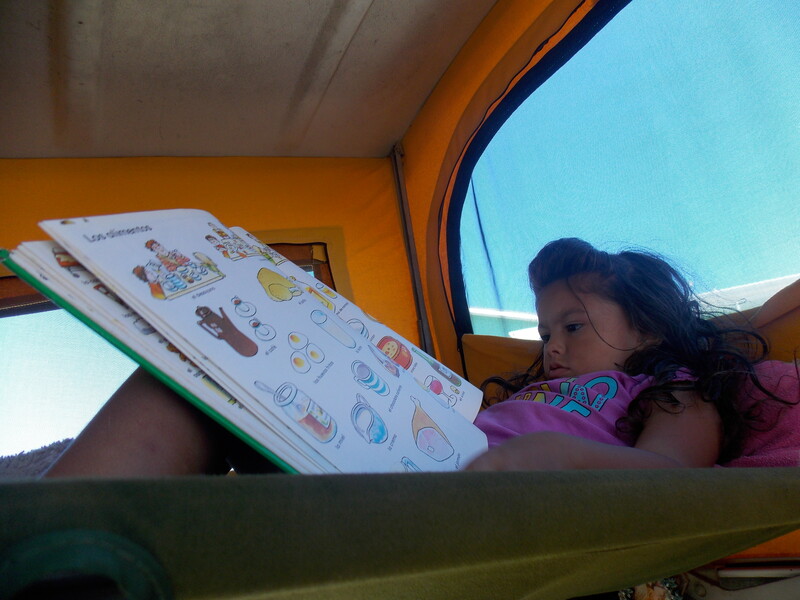 I look at this picture of my daughter, so young and full of innocence, and I see happiness in the reading of a book atop her Camper Van perch. It brings joy to my heart to remember the day I snapped this moment in time. It makes me smile. Isn’t that what it’s truly all about—to live in the moment, and never miss the forest for the trees? For me, it is as simple as that. May you find your simple pleasures every day, and always take time to stop…and smell the roses in your garden of life. Many Blessings your way that you will enjoy this beautiful new day, and find your Bliss…no matter how simple it may be.